When she’s not in the lab, you can find Maureen hiking outside with her dogs. She loves nature and thinks dogs are wonderful for reminding us to take a break from our hectic schedules to enjoy life. Maureen is also a fan of traveling, cycling, and yoga. She is a researcher at the The Wistar Institute in Philadelphia, which is a small biomedical research institute with about 30 scientists. Maureen’s research is aimed at understanding and developing cures for cancer. Specifically, they focus on the p53 tumor suppressor protein that is responsible for stopping tumors from forming. Maureen has dreamed of curing cancer since she was about 12 years old. At that time, she knew she had a lot of energy and enthusiasm and was looking for a career she could pour all of this energy into. Maureen briefly considered a career as a nun since she was a student in a Catholic school, but something about cancer research piqued her interest. In college, Maureen was also passionate about literature and writing, so she started pursuing a dual major in English and Biology. However, a later course in Molecular Biology convinced her to dedicate her efforts to a career in science. The most difficult thing for today’s scientists is to get funding for their research. Right now is probably the tightest time for NIH funding in U.S. history, and funding rates at the National Cancer institute are only 9% for cancer research. These dismal rates have persisted now for about 10 years, and many passionate, excellent scientists doing cutting-edge research are dropping out of science. Maureen has benefited from the collaborative environment at Wistar in terms of submitting large, collaborative grants, but securing funding is still a challenge for researchers there. One of the big transition moments that shaped Maureen’s career was when she decided to work with mouse models, rather than limiting her research to cell cultures in test tubes and Petri dishes. It has been thrilling to successfully create models of different p53 tumor suppressor protein variants. They were surprised to discover that one of the p53 variants they were studying seems to play a part in curing diabetes, and this was an exciting and unexpected success that they are working on publishing now. The International p53Workshop is one meeting Maureen particularly enjoys. A group of researchers studying the p53 protein get together every two years, and this meeting has allowed her to travel to Greece, Scotland, China, Australia, and other exciting destinations. Her favorite place that the meeting was convened was New Zealand. The beautiful scenery, friendly people, and diverse geography were wonderful to experience, and she will never forget the dolphins they saw when visiting a picturesque saltwater lake there. In research labs, there is a constant flux of people joining and leaving the lab to go on to new things. When someone is ready to leave Maureen’s lab, they are given the book Oh, the Places You’ll Go! by Dr. Seuss. All the lab members cover the pages of the book with pictures, messages, memories, and advice for that person so they can carry it with them to their next adventure. If you think of your life like a pie, you should make sure to make all of the pieces of your life (family, work, fitness, finance, etc) are as big as you want them. Always review your pie and make the necessary adjustments to ensure you are keeping everything in balance. Also, make sure one of the pieces in your pie is volunteering so you can give back to your community. Maureen Murphy received her Ph.D. from the University of Pennsylvania School of Medicine in 1993, where she worked with Dr. Donna L. George, the discoverer of the MDM2 oncogene. Maureen performed post-doctoral work at Princeton University working with Dr. Arnold J. Levine, the discoverer of the p53 tumor suppressor protein. At Princeton Maureen studied how p53 induced programmed cell death, with funding by the Jane Coffin Childs Memorial Fund for Cancer Research. 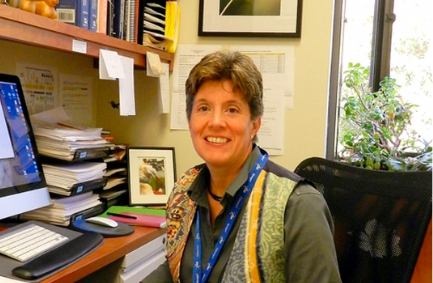 In 1998 Maureen obtained a position on the faculty of the Fox Chase Cancer Center, where she obtained tenure in 2003, and became a full Professor in 2011. In 2011 Maureen moved her laboratory to a position at The Wistar Institute. There, Maureen gets to engage in her three passions: discovering ways to reduce the burden of human cancer, training the next generation of cancer researchers, and helping mentor the junior faculty at Wistar. In her private time Maureen enjoys reading, running, cycling, and most particularly hiking through the woods with her partner Kami and their little dog, Rupert.